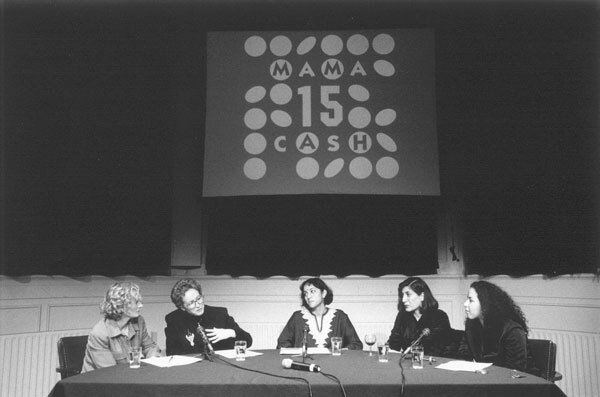 Mama Cash’s 15th anniversary celebration in November 1998 attracted a lot of public and media attention. Her 10th anniversary in 1993 had been a smashing party, but this time she wanted it to be even bigger. She organised a retrospective exhibition, displaying the work of the winners of the Mama Cash Art Award, a public conference and expert meeting on women and money, a film and video festival and a workshop on fundraising. The anniversary week concluded with a big party. ‘We wanted to celebrate women’s financial successes’, the anniversary report states. On the occasion of her anniversary, Mama Cash launched her first website, co-financed by the Rabobank. Mama Cash invited feminist partners from various parts of the world, women’s and other funds, and representatives of banks to attend the public conference and the two-day expert meeting: ‘Women and Financial Resources’. Her goal was for participants to contribute to the international debate about gender, sustainable development and the flow of financial resources. They discussed autonomous women’s funds, women controlling money and the advantages and disadvantages of microcredits. These were productive and inspiring days, particularly due to the vivid and critical contributions of the audience. Elaborating on the views of the 1995 UN World Conference on Women in Nairobi, guests attending Mama Cash’s conference concluded that autonomous women’s funds should be created throughout the world. ‘Instead of the North supporting the Global South, an independent flow of financial resources should exist in the Global South,’ the anniversary report firmly concludes. One of the most striking results of the expert meeting was the on-site creation of an international umbrella organisation for women’s funds: the International Network of Women’s Funds, INWF. The conference, as well as the expert meeting, were co-financed by the National Commission for Sustainable Development (NCDO) and the Rabobank. During the film and video festival, a selection of more than one hundred films and videos made by women who had received Mama Cash’s support was shown. The large variety of subjects, such as racism, lesbian romance, fundamentalism, refugees, eating disorders and the oppression of women, captivated the attention of a wide range of visitors. Afterward, the audience was invited to engage in an in-depth debate about the political aspects of the films and about the position of women film makers. The final celebration, ‘Women of the World’, was a happening with 1,100 (mostly) women gathering in the Amsterdam concert hall, Paradiso. The guests received champagne upon arriving. Mama Cash awarded several prizes including the Award of the Global South, a motivation award in the form of 15,000 guilders (7,150 euros) for women striving for structural change. Ngonu Chaidzo, the first lesbian black women’s group in Zimbabwe, won this award. Relocation Management Services, an enterprise that facilitated the repatriation of Dutch expats, and a young black woman who had just set up a fitness studio, received Dutch entrepeneurship awards of 2,500 guilders (1,200 euros) each. The Culture Fund awarded two Mama Cash Film Awards of 5,000 guilders (2,400 euros) each. The American Global Fund for Women and the Mama Cash Central and Eastern Europe Fund together awarded the Lydia Sklevicky Award to Motrat Quiriazi from Kosovo. The group received the award from Sklevicky’s daughter. There were opera singing majorettes with a birthday cake. Guests who preferred some peace and quiet could have tea in the ‘Mama Cashba’, that also offered aromatherapy, massage, palm reading, and henna tattoos. The festivities complete with a band created for the occasion consisting of musicians from different generations such Rosa King and the rapper Strezz. The Mama Cash Party was daring, swinging and exuberant! The 15th anniversary attracted a lot of media attention, as well as many new donors. Interviews in newspapers and magazines gave Mama Cash the opportunity to deny the completion of women’s emancipation, as many politicians, policy makers and newspapers had suggested back then. 1998 was an excellent year.